"You're the book that I have opened. 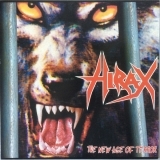 And now I've got to know much more"
New Age of Terror - Hirax CD-JEWEL CASE Free Shipping! Sorry, no matches on iTunes for "New Age Of Terror Hirax".